The best place to start is by looking over our camp packing list. Send play clothes! Campers should bring t-shirts and shorts that are OK to get dirty, or activity-appropriate clothing such as jeans and boots for horseback riding (required), swim suits for swimming, etc. A nice outfit for dance night might be important. Good tennis shoes are a must at camp. If your child does not know how to tie her shoes yet, the Velcro closures will accommodate her dressing quickly between activity times at camp! A small plastic bucket will be helpful in keeping up with her shower items, shampoo, soap, etc..
For your child's safety, riding boots or hard-soled shoes with a definite heel ARE REQUIRED to prevent the foot from sliding too deeply into the stirrup and becoming dangerously wedged. Thank you for not putting us in the position of having to refuse your child the pleasure of riding because of lack of proper foot attire. Bring a White T-shirt (100% cotton) for Tie Dyeing. It’s ok to bring more than one if you want. 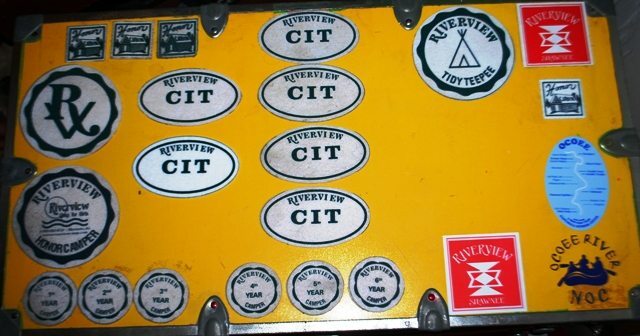 A Riverview logo shirt works well for this too and are available for purchase in Chiki Boutiki. We have lots of fun things to do each day…that are above and beyond activities! Tie-Dye Tuesday - wear something Tie Dye! We have adorable camp Tie-Dye t-shirts in Chiki Boutiki that are perfect for this. Wacky Hair Wednesday - Wear something fun in your hear on this day! Mrs. Susan always wears a big flower! Navy shorts and a white shirts (camp t-shirts are fine) are required. Every cabin group will be assigned a day to be in charge of the ceremony. Bring appropriate fun items OR buy them in Chiki Boutiki. Session M: Beach Party Blow-out! Session 4: Miss Riverview Pageant! Navy shorts and a white camp t-shirt are required. Riverview reserves the right to cancel any trip if there are not enough participants. Water shoes that will not come off easily! Please discuss with the director to determine appropriateness and safe storage of musical instruments, sports equipment, etc. BEFORE bringing them to camp. Are always fun to use at camp! Our purpose in having a "not to bring list" is to create a safe and wholesome environment that all children and staff can experience. We want campers, staff and parents to know that Riverview is a camp community with guidelines and boundaries that offers security and safety. All articles should be marked with name tape, stamp, laundry pen or permanent marker. Please make sure to label everything you send to camp. Please remember to mark socks individually, and all personal items such as hair brushes, tooth brushes, shampoo, tennis racquet covers, - EVERYTHING. 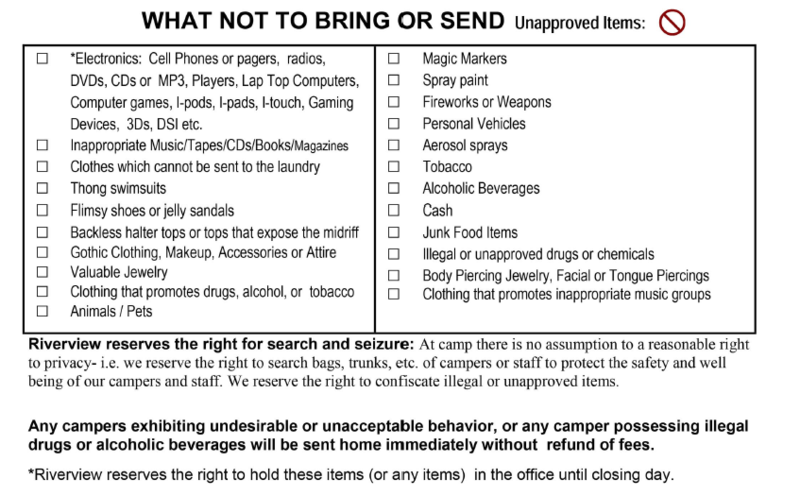 Please do not bring any valuables to camp! We cannot be responsible for lost things. Food or gum in cabins will attract little critters, disrupt healthy appetites, and can be a divisive factor if not shared with cabin mates, not to mention pose a possible health risk for those with severe food allergies. The camp store has a large variety of carefully chosen snacks and treats available for snack time. We are nut free all summer every session, therefore, we prefer that you NOT mail or bring food. No electronics. Camp is a busy, fun, activity-filled, relational community that enhances your daughter’s life in ways far beyond “electronics”! Most campers will tell us that they “love” not having the “electronic stuff” while they are at camp.